This page is dedicated to Daphne who loves raising seed and now has some extra south facing window sills. I’m pretty useless at it, and I’m an anxious germinator. I love the moment when you see minute disturbance in the soil and you know the green shoots are pushing upwards, but I’m not very patient. But here are some ideas for us to think about for the next season which is fast approaching. We’ll be getting some free seeds as part of the RHS Britain in Bloom ‘It’s Your Neighbourhood’ scheme: Chives, parsely, coriander, dill, garlic chives, thyme, fennel, redfrills mustard, nasturtiums, marigold, radishes, carrots, spring onions and spinach. We’ll be sowing them as part of the ‘It’s Your Neighbourhood’ events on Sunday 14th April: come along and help! Also needs protection from slugs, snails and caterpillars! Early last year, we were picking cavalo nero and chard regularly from the salad bed. We planted more cavalo nero (a favourite ever since Jo from Shaftesbury Road left us some odd seedlings in 2011) chard and kale, but the garden suffered a major caterpillar attack in the summer which wiped out our brassicas. Meanwhile, the mint plants have run riot. So the salad bed needs a bit of attention. It’s in partial shade, sheltered by the south facing wall. As Colleen Vanderlinden says “… a good rule to remember is that if you grow a plant for the fruit or the root, it needs full sun. If you grow it for the leaves, stems, or buds, a little shade will be just fine.” As a leaf bed, it will require relatively high nitrogen and good moisture. We mulched with manure in the autumn, which should help moisture retention and nutrients, but we’ll need to check both the soil structure and nutrient levels, as the saturation may have leached nutrients from the soil. Lettuces: e.g. ‘Cos Freckles’ – read Naomi Shillinger’s wonderful blog on this – and ‘Nymans’, a beautiful red variety. The frilly lettuces seem to be less slug prone. Raised bed 2. The bean bed. The climbing beans worked well in 2012, producing a fairly good crop despite dismal sun. We also planted onions and courgettes in this bed. The onions produced a fantastic crop and the yellow courgettes were worthwhile. We’ve already planted up this bed with onions (where the beans were) and leeks. I wonder whether we can place our bean wigwams where the courgettes were, at the south end of this bed? Courgettes are such reliable plants, it would be a pity to give up on them, but perhaps this year we could try growing them vertically, beside the cordonned pear trees? The variety Black Forest F1 produces dark green 6” fruits and needs to be trained, like a cucumber (see below). Climbing French beans , e.g. ‘Cobra’ which grows to 1.80cm, at the opposite end to last year. Well, the raspberry canes have truly established themselves, sending out runners which we may need to dig up and pot up. We had kale in the raspberry bed last year. Beautiful though it was, it got infested by caterpillars. This bed gets a bit more sun than the shady leaf bed, so perhaps we could try beetroot on the opposite side to the raspberries? I’ve found an interesting beetroot ‘Alto‘ which is more root than ball and is billed as a space-saving variety which is very sweet, and it has the RHS AGM. If it works, that’s just what we need. Our fruit trees are growing vigorously, as are the strawberries we’ve underplanted. We also sowed garlic in the sunnier bed, which appears to be growing well. So, these beds are already spoken for, apart from odd spaces which will appear when we harvest (or give up on) the overwintering frisee lettuce. We can plant shallow rooting leafy veg seedlings here throughout the season, depending on what we have spare. We tried tomatoes, chillis and peppers here in pots and grow bags, but 2012 really was not a fantastic year. I’m sure we’ll try tomatoes again. They are wonderful, but unless we have a good sunny summer, it’s quite hard getting them to ripen outside of a greenhouse. Perhaps we could try the vertical courgettes, planted in a large container (needs to be at least 18 in./45 cm in diameter)? This is also where we would place pots of coriander, thyme and basil – the sun-loving herbs. 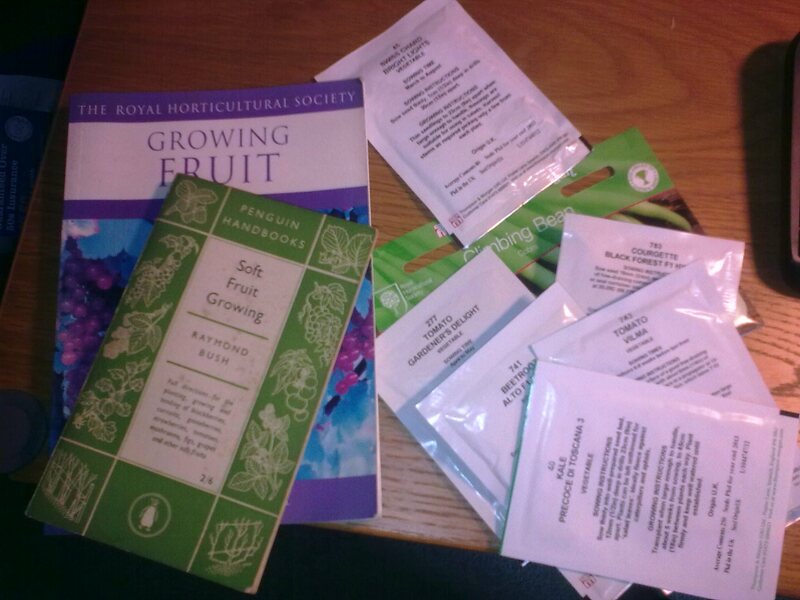 We are also getting carrot and spring onion seed from the RHS. John Harrison in Vegetable, Fruit and Herb Growing in Small Spaces suggests sowing carrots and spring onions together in a trough to try to deter carrot root fly: they love the smell of carrots, but hate the smell of onions. He suggests that this is entirely suitable for container growing. We’ll need to cover it with horticultural fleece to protect from those flies who hold their noses against the onions. The only question is … where do we put the container? This entry was posted in Edible growing. Bookmark the permalink.